Scientists from GNS Science and the University of Canterbury have been busy in the wake of Saturday morning’s 7.1 magnitude earthquake in Canterbury attempting to learn more about the quake and what caused it. Credit has to go to GNS Science’s John Ristau, Canterbury’s Mark Quigley and Kevin Furlong, professor of geoscience at Penn State University who is on sabbatical in New Zealand at the moment. The three scientists and others from GNS fronted to the media yesterday from early morning and were able to articulate what had happened from a geophysical perspective. Interestingly, as the release below from Canterbury University just issued illustrates, the earthquake’s location has come as a major surprise to scientists. The fault that ruptured causing the magnitude 7.1 earthquake early Saturday morning was previously unknown, according to University of Canterbury geologist Associate Professor Tim Davies. ’The earthquake on 4 September exceeded all previous scenarios for seismic shaking at the University of Canterbury. An event of about the same magnitude on the Porters Pass fault had been anticipated, but the 4 September earthquake was very much closer — about 30 km away instead of at least 60 km. Thus the shaking intensity on the UC campus was very much greater than expected. Though significant damage to structures, infrastructure and contents has occurred, the situation could have been very much worse. ’By comparison with the expected Alpine Fault earthquake, which will be a very much larger event but several times farther away, the 4 Sept earthquake caused severe damage in Canterbury but did not disrupt infrastructure (e.g. power generation) island-wide. Further, occurring in the early morning at a weekend was probably optimal in terms of lack of deaths and injuries,’ said Professor Davies. ’The aftershock sequence appears to be fairly normal, and the most likely scenario is that aftershocks will continue; some may be significant and capable of causing further damage; but a repeat of the M= 7.1 quake is unlikely. 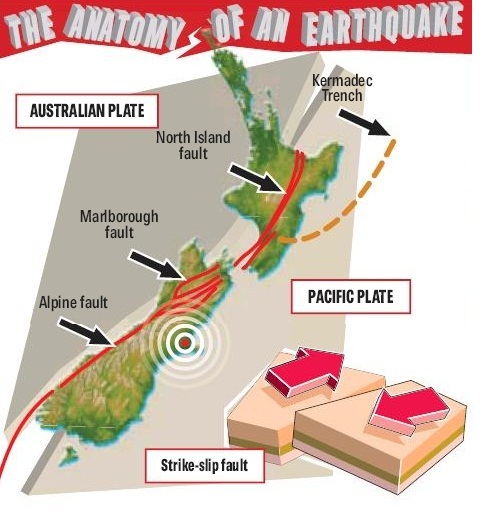 ’While it is possible that the ‘new’ fault rupturing on Saturday 4 September could trigger an earthquake on another fault, for example the Porters Pass fault, the Hope fault or even the Alpine fault, over the next days, months or years, the probability of this is unlikely to be high.